If you want to buy some new shoes you should consider a special offer from Crocs Canada. Sale styles are now available with an extra discount. 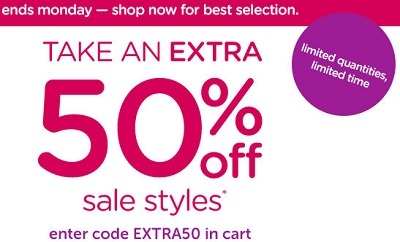 Take an extra 50% off. Offer is available online only. You must use a promo code to receive the offer. Enter code EXTRA50 in cart. The offer ends on Monday, September 21, 2015.The offer is valid on sale styles only and can't be combined with other offer. You can also receive free shipping on orders over $100. Official source of the information is Crocs Canada. More details about the promotion available on the official website.